The rabbit house is a warm, fluffy, beautiful pet, quite undemanding in food, as well as an unusual pet, which will cause interest of visitors. Of course, every coin has two sides, and with his rabbit owners get liability for the pet and the arrangements for his upbringing and care. 1. Where will pet live? It requires necessarily a cell, preferably equipped with a toilet, a secluded house, where the rabbit can hide from strangers in case of an alarm situation, as well as a hay feeder. 2. Who will be the responsible owner of the rabbit? This person should daily take care of condition rabbit cage, transferring its functions to another home if for some reason cannot do it himself. In addition, the owner must regularly visit the vet for a checkup rabbit and routine vaccination. 3. Are you ready to take on this responsibility? We are responsible for those who tamed. It is not necessary to follow trends or succumb to their desires without taking their responsibility and not clearly thinking about it. There are so many different varieties of ornamental rabbits: from dwarf to quite a large rabbit, from Shorthair breeds to the long-haired, with small ears or fold. You can always get quality advice from breeders or stores. Also you can examine special forums and even breeders to purebred rabbit for free, simply in good hands. The main thing is not to buy a pet in the subway, random street vendors and other "suspicious" areas. In this case, you run the risk of getting a sick animal. Adaptation period can last quite a long time. Pet needs to get used to the owner and a new place. Patience and love will help this process to move faster. Treat pet treats, pet like cat and talk to him, calling by nickname. Take care of the rabbit wire, Wallpaper and wooden furniture. A young rabbit will actively sharpening his teeth on these items. And the meeting with electrical wires is dangerous for the life of your pet. Try to avoid large concentrations of people near the rabbit cage, it is very scary. For vacation it is advisable to negotiate with relatives to visit the pet at your home, not to take the rabbit to a new home, change of environment is very difficult for these Pets. If your vacation is short, up to 4 days, then you can safely leave the pet unattended, providing a good supply of water and hay. The teeth of rabbits grow continuously, so they're always looking for solid material grinding. Is to pick a twig from the tree and bring a pet. In the warm season you can walk with a rabbit a walk in the Park. 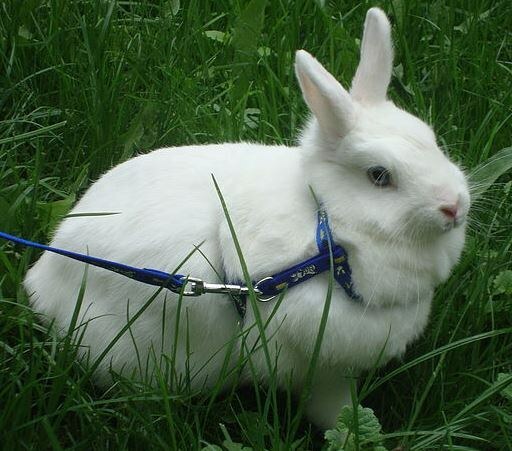 Rabbit are in a special carrying case for cats, and in the Park you can walk him on a special leash. Watch carefully so that the rabbit does not eat a lot of green grass, it can have a detrimental effect on his digestion. Rabbits are well characterized by their masters, they know where their cage is, and they can be trained to pee only in a certain place. Have fun communicating with your pet and it will love you back.